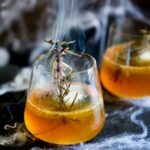 For a simple bourbon based cocktail, why not try this Haunted Graveyard Halloween cocktail. It is perfect for a fall or halloween party as it combines, bourbon and maple for a warm you up drink. 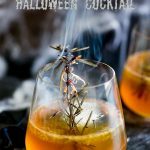 Plus the creepy smoking rosemary adds a bit of spooky fun to your drink. Everyone loves a bit of theatre and this maple, bourbon and orange cocktail is sure to impress. Another Friday and another halloween cocktail, because a) halloween is coming and b) I love cocktails. This cocktail is a fall cocktail winner. It is slightly warming, deliciously complex and the added theatre from the smoking rosemary makes it perfect for halloween. What goes into a Haunted Graveyard? A cocktail shaker or mason jar. 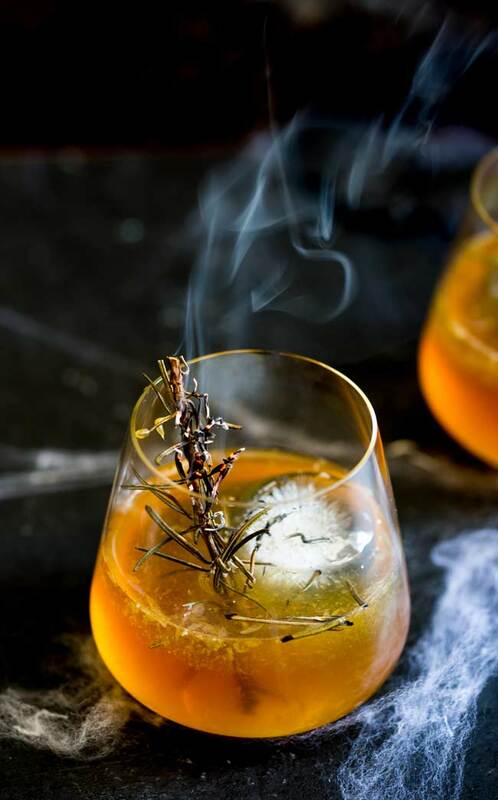 The bourbon, maple syrup and bitters are shaken together with an orange slice, rosemary leaves and plenty of ice. 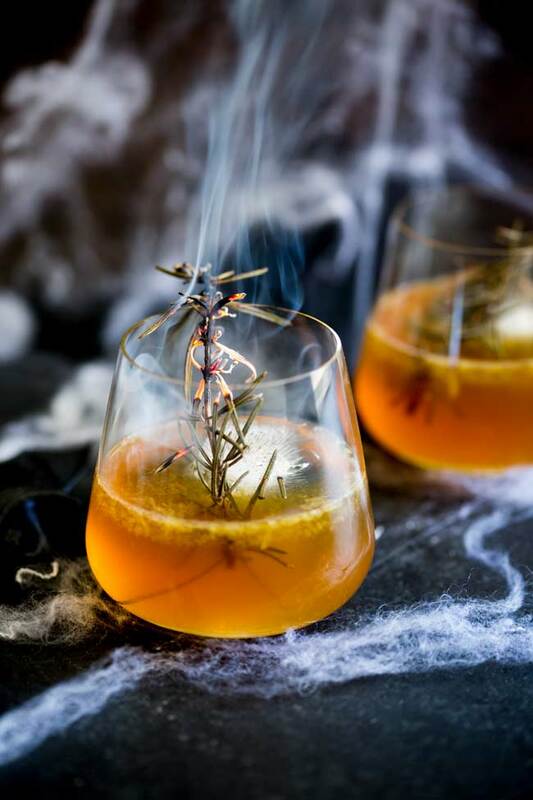 Then strained into glasses and garnished with the smoking rosemary stem. I don’t want to use a smoking twig of rosemary. No worries, just leave the final rosemary garnish out of the cocktail completely. You will still get a little woodsy rosemary taste from shaking the cocktail together. If you want to garnish this with something less smoky then you can add a wedge of orange, or garnish with rosemary but don’t set it on fire. Bitters are a concentrated mixture of alcohol and bitter or sour botanicals. The most iconic bitters is angostura bitters. It has the label that is too big for the bottle. I remember it from my parents liquor cabinet and most people have seen it on the shelf in a bar. These days though bitters are super popular and more and more varieties are becoming available. 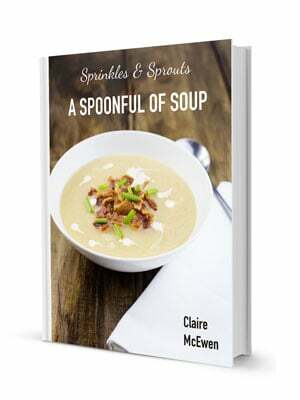 The flavors range from normal like orange, grapefruit and lime, to downright bizarre like Mexican mole, cumin and celery. I have a growing collection of bitters as I just love the small dropper bottles. I think it is the scientist in me. Which bitters should I use? 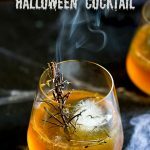 For this Haunted Graveyard cocktail I would pick something like orange or grapefruit bitters. If you can find it rosemary bitters is also fabulous here. Or if you love the woody peaty tasting bourbons, enhance that smoky taste and add a drop or two of smoke bitters. 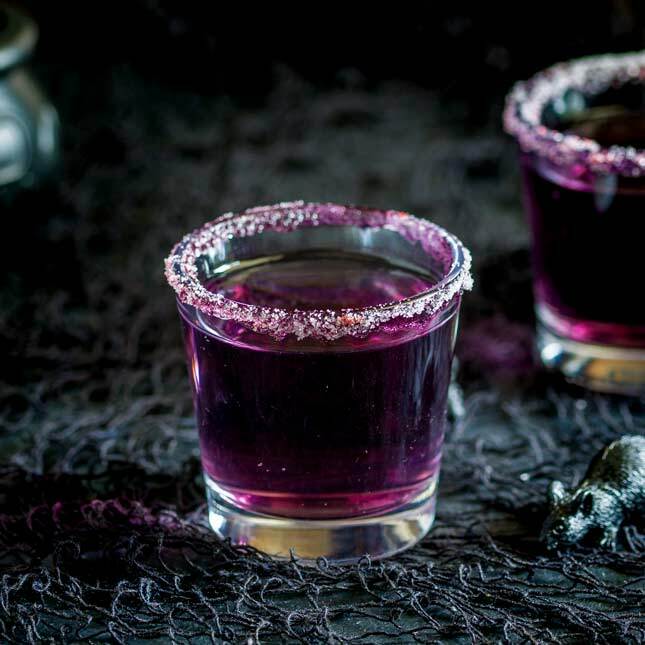 If you are looking for other delicious Halloween cocktails check out my Witches Brew and my Witches Blood. 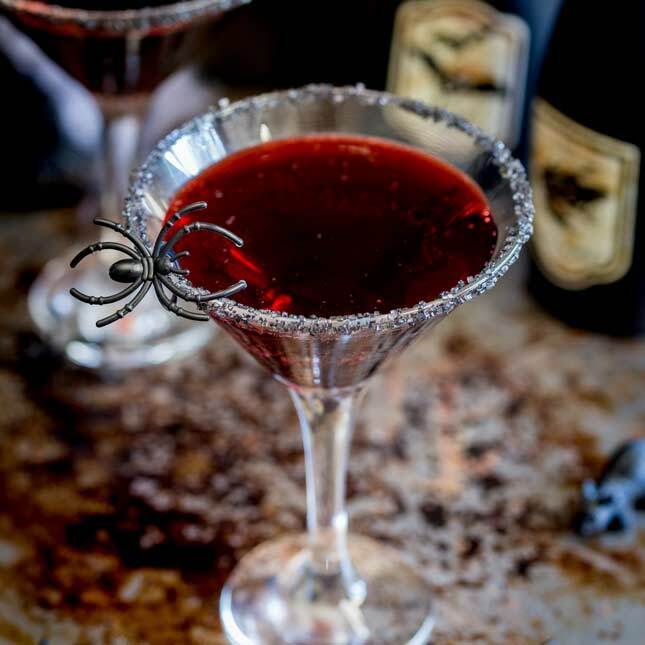 Why not pin this Halloween Cocktail recipe. Pin it here. Pour the bourbon and maple syrup into a cocktail shaker. Add the ice, orange slices and sprig of rosemary. Add the ice to a short whisky glass and strain over the prepared cocktail. To enhance the maple and bourbon pick a bitters from this list. or experiment with some new combinations. If the smoking rosemary isn't your thing, you can either garnish the cocktail with an orange slice or curl of zest. Or use the rosemary but don't set it on fire. The fresher your rosemary the less likely it is to just set on fire and the more likely it is to just smoke. 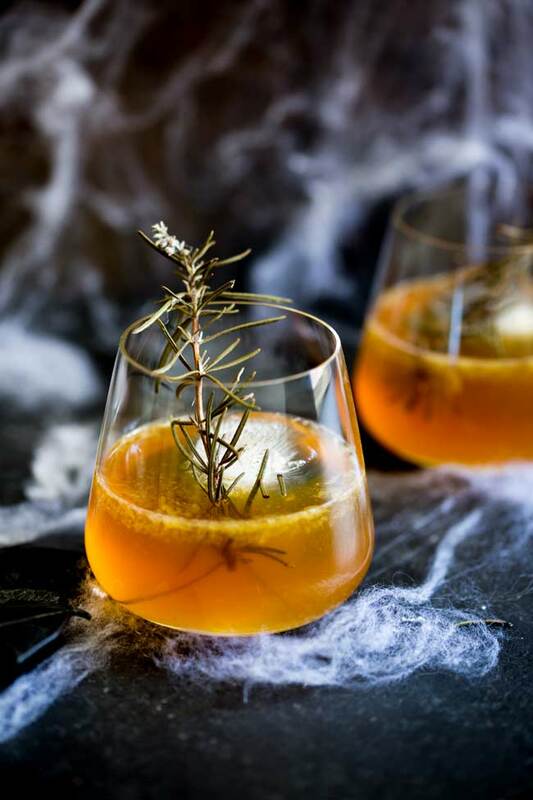 If you love food why not subscribe to my newsletter, I will drop you an email every now and then, just to say hi and send you a couple of recipes I think you might love, like this Halloween cocktail. My husband and I love bourbon, so this cocktail is perfect! I have everything on hand to make it, so I will definitely be trying it out this weekend!